The main objective of this thesis was to find the root causes of accidents that have resulted in damages. 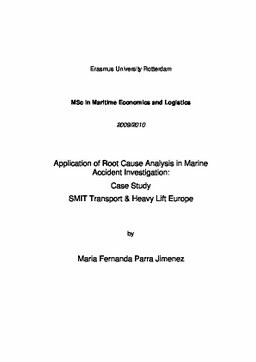 In order to find the root causes, the Root Cause Analysis methodology was applied on the information supplied by the business unit of SMIT Transport & Heavy Lift Europe. When applying the RCA, it was realized that the quality of the data available did not permit the full application of the RCA, since the result was either a repetition of several types of generic causes or a wide variety of types of causes, making the correlation of causes to the incidents a difficult challenge. As such it was decided by mutual consent with SMIT to search for the direct cause and to apply a more practical classification in the form of operation, administrative, technical, external or environmental factor. As a result it was brought to the attention that roughly fifty percent of the events are directly caused by operational factor. Apart from finding the direct causes, this thesis researched the monetary effects that the damages had on the business unit under investigation. This effect was measured by using the available Hull & Machinery insurance information and analyzing the proportion of damages that could be legally claimable and the quantity of events that were actually claimed. The result is that during the period of time been analyzed, only 3% of all the damages were claimed from the insurance company, and the remaining 97% of the damages had a value lower than the standard premium. Finally by using the rest of the information available, it was possible to confirm that damages are not influenced by only one variable, but instead, they are triggered by many external and internal variables making it an unexpected event. Also in this particular case, the market of the business unit studied is driven by many other markets like dredging, wind energy technology and infrastructure, all of which can rely either on government funding or on private investment, making it difficult to correlate the amount of damages suffered with the business cycle. Thus, the occupancy rate of the vessels, defined by SMIT as the amount of days per period of time that the vessel is productive, could give more insight on whether the amount of damages are related to the business cycle. Besides the above, some assumptions could be made by analyzing the database. Between others, it was noted that the amount of damages reported can be influenced by the following variables: i) seasons, ii) dry-dock period that allow to discover damages and thus large numbers of events are reported in a short period of time, and iii) that the crew mentality plays an important role on the number of incidents that are actually reported.